Don't Eat the Paste: Book review - Whoopie Pies! Whoopie Pies by Sarah Billingsley and Amy Treadwell is just a wonderful collection of recipes of the cake and filling combinations. The photos are fantastic and the art is just darling, which make it a very nice gift for friends who bake. 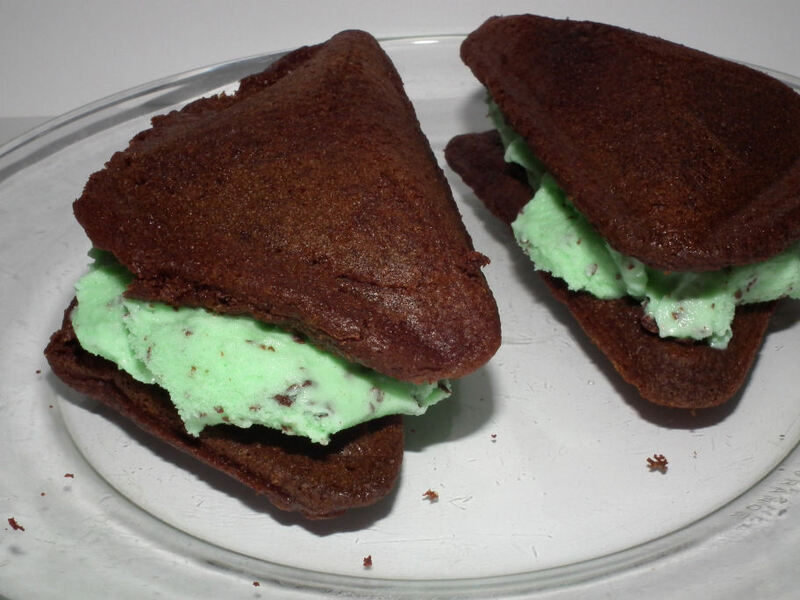 Whoopie pies are becoming increasingly trendy. If you've never had one, the basic whoopie pie is a sandwich made of soft moist cake like cookies and a marshmallow fluff filling. In the introduction they talk about some of the history of the whoopie pie and offer a few pages of combination suggestions like a Death By Chocolate which has chocolate cakes, filling, glaze and is decorated with more chocolate or more exotically, Whoopie Satay which combines peanut butter and chocolate flavors with a bit of curry. It's also a great book for your own collection. There are several cake recipes, starting with the traditional chocolate and then going into many others including some vegan and gluten free cakes and non-traditional flavors such as pistachio-cardamom which bring these sweet treats up from being a guilty pleasure to something you could serve at dinner parties. The fillings start with the traditional marshmallow fluff then the sky is the limit. There are buttercreams, cream cheese, ganache in many flavors and styles, there is a maple-bacon filling even for people who love sweet/salty combinations. Definitely a book I'll use often. I think my family will be perfectly happy with stacks of whoopie pies instead of cakes for their birthdays. Since there is so much mix and match possible in here, I can tailor them to individual tastes simply by changing the filling, seasoning a filling or adding favorite fruits. So Dad can have his basic chocolate on chocolate on chocolate, my daughter can have something with a bit of spice and my son can have lots of fresh fruit. You can get this book directly from the publisher, Chronicle Books or from by clicking here from Amazon, Whoopie Pies (Cookery) .The Amazon link is an affiliate link and helps pay some of the costs of maintaining this site. A quick tip, since my oven still isn't fixed (but he promises it will be soon), you can make the cakes using a sandwich maker. They turn out a bit bigger than the usual size, and triangles instead of round, but using a sandwich maker means if you have the cake batter covered in your fridge you make them to order, just a couple at a time. Since I didn't have the ingredients for the fillings on hand, I just filled these with ice cream and they were a hit.